There are various traditional paper arts in Japan and kamikiri, paper cutting craft, is one of them but the difference from other paper arts is that kamikiri is also a stage performance. The performer cuts out a silhouette of something without drawing lines on a piece of paper. Usually while cutting the paper with scissors, the performer keeps talking to entertain the audience. So it is very complicated and hard! The follow video is a kamikiri expert, Hayashiya Imamaru’s performance. Having 50 years of kamikiri experience, he can make any silhouette by requests and make profile of a person instantly. 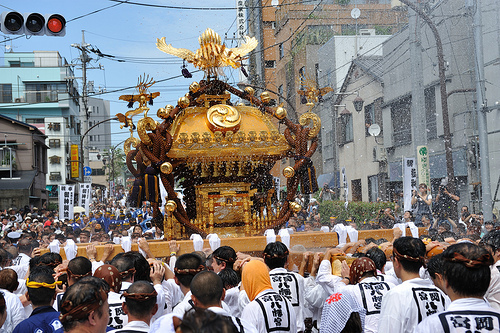 In the video, he makes a geisha, audiences’ profiles and people carrying a portable shrine. Although he makes them very quickly, the lines are so detailed. When you watch the following video, I want you to pause to see how beautiful the silhouettes are. For those who’ve never seen a portable shrine, this is a picture of it. Now, enjoy the kamikiri performance! I think paper cutting crafts are not so rare but this man has got extraordinary skill. It is very amazing how he makes those silhouettes so easily.